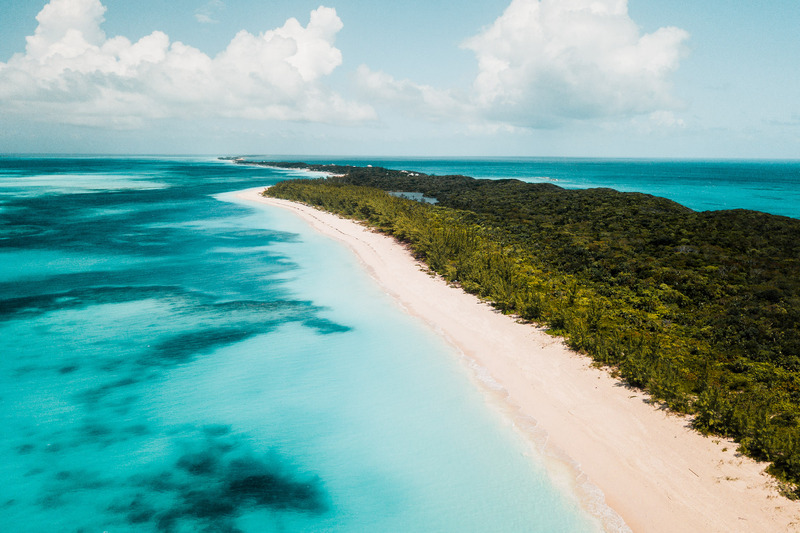 Left to right from top: One of the beaches at Rose Island, aerial views of Rose Island, swinging at Sandals private island, Sandals private island at sunset, ‘stranded’ with our boat on Rose Island. 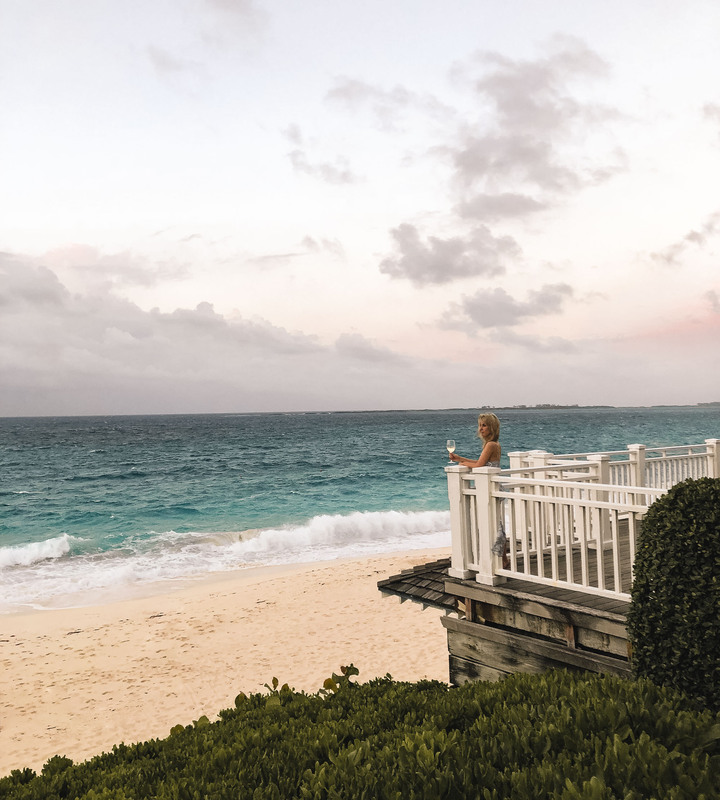 While there’s plenty to explore on-island, the place you stay in Nassau will dictate the experience you have. 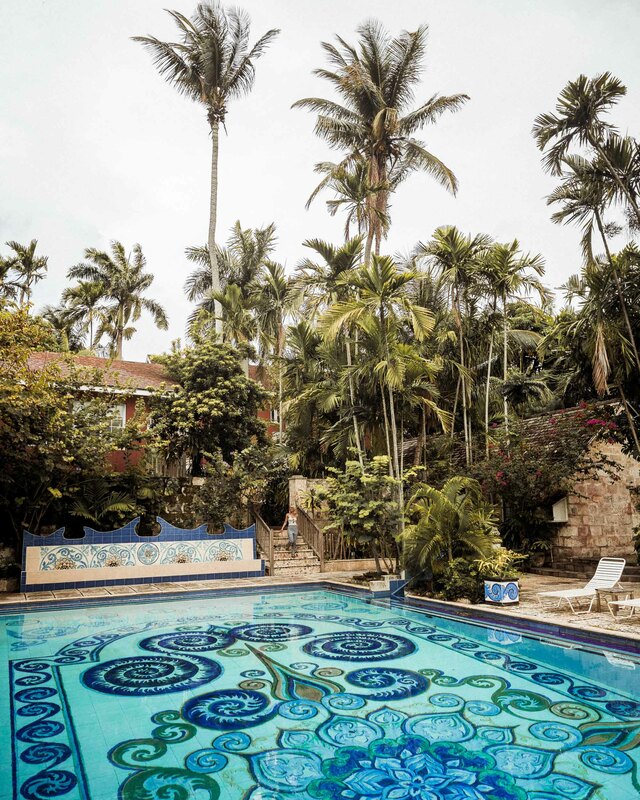 In addition to the popular all-inclusive resorts, there are options for laid-back hotels, boutique hotels or a house rentals. No matter where you end up, you’ll also want plenty of opportunities to try the local food and culture! SLS Baha Mar – We absolutely loved this newly-built hotel. 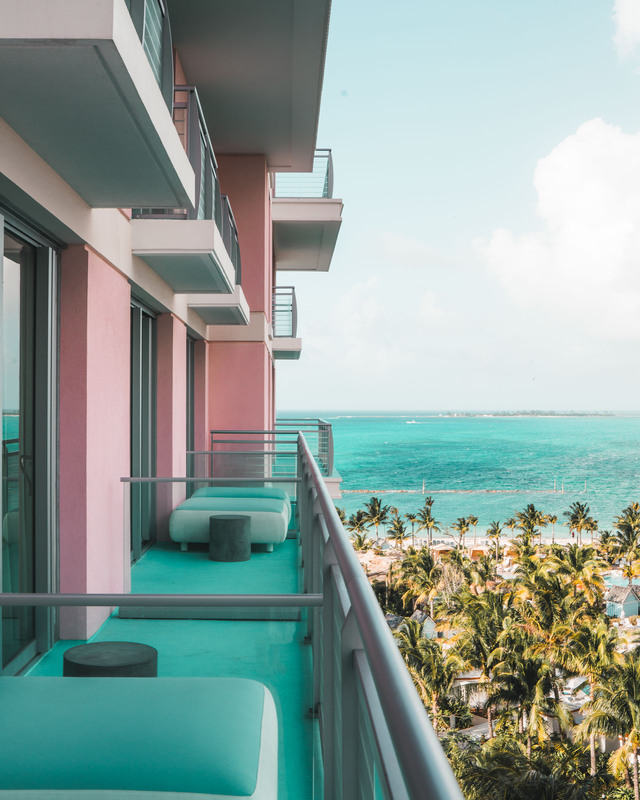 Everything from the room (clean white, with nods to retro style), to the grounds (the poké food truck and daquiri stand were our favorite) to the service was impeccable. We also had our favorite meal of the trip here at their in-house restaurant, Cleo. Balcony views from our room at the SLS Baha Mar hotel. The pool at the SLS Baha Mar. 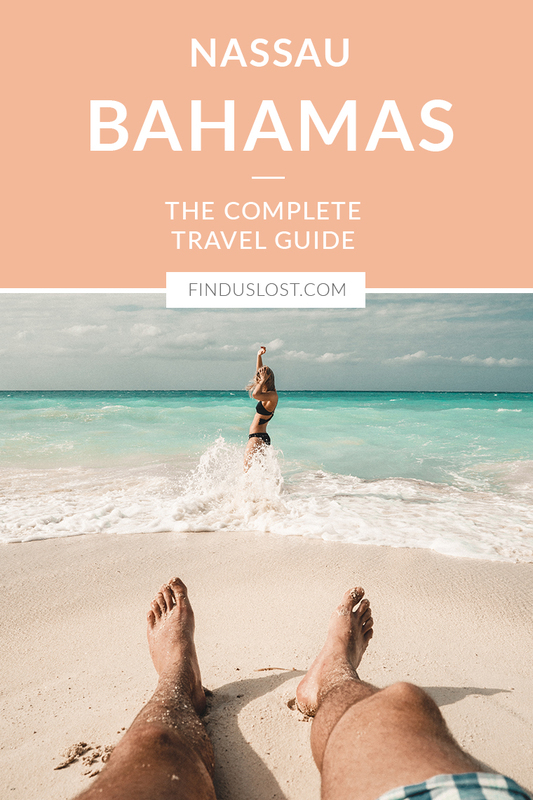 Sandals Royal Bahamian – this was our first time staying at a Sandals resort! 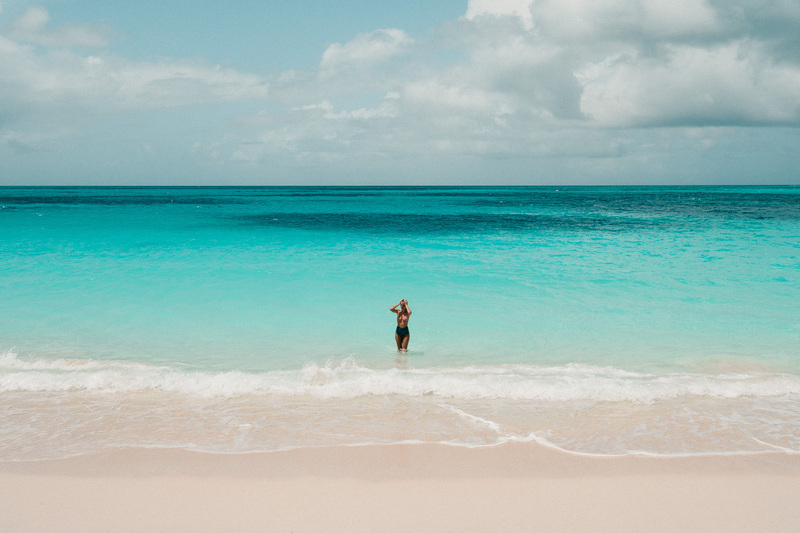 While an all-inclusive resort isn’t typically our go-to, Sandals’ private offshore island was definitely a highlight for its pristine beach. We also loved their oceanside restaurant, Gordon’s on the Pier. 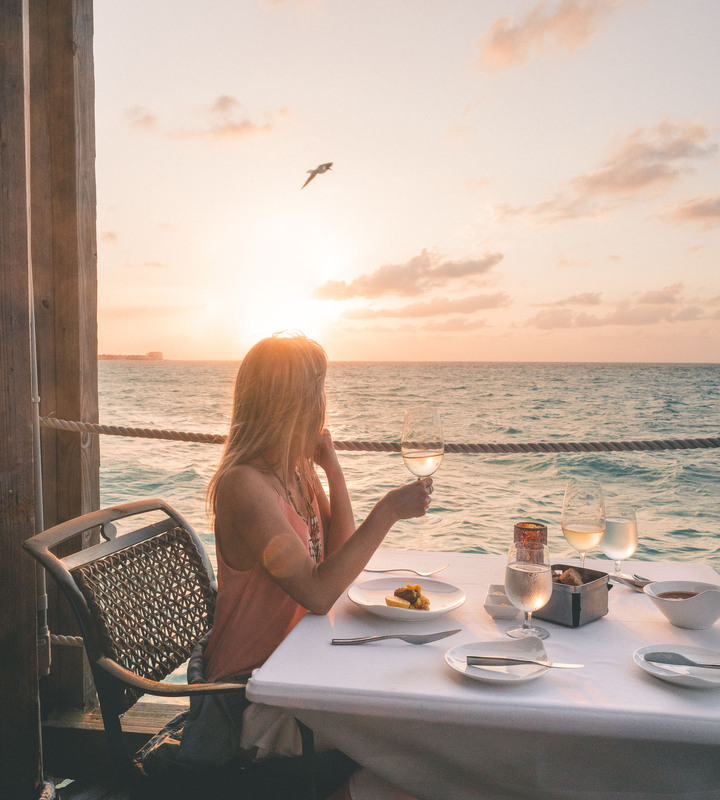 A sunset dinner at Gordon’s on the Pier at Sandals. 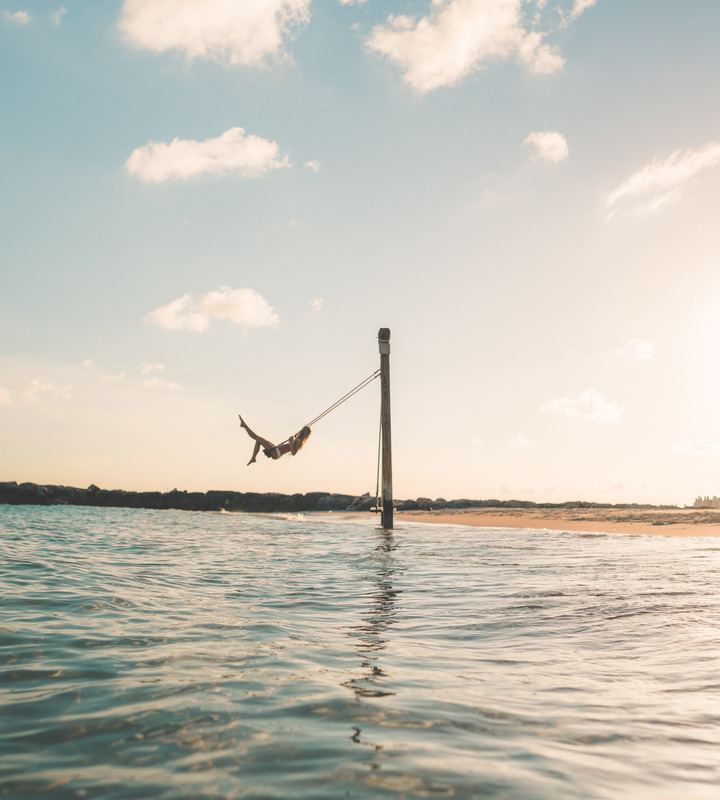 Swinging at sunset on Sandal’s Private Island. 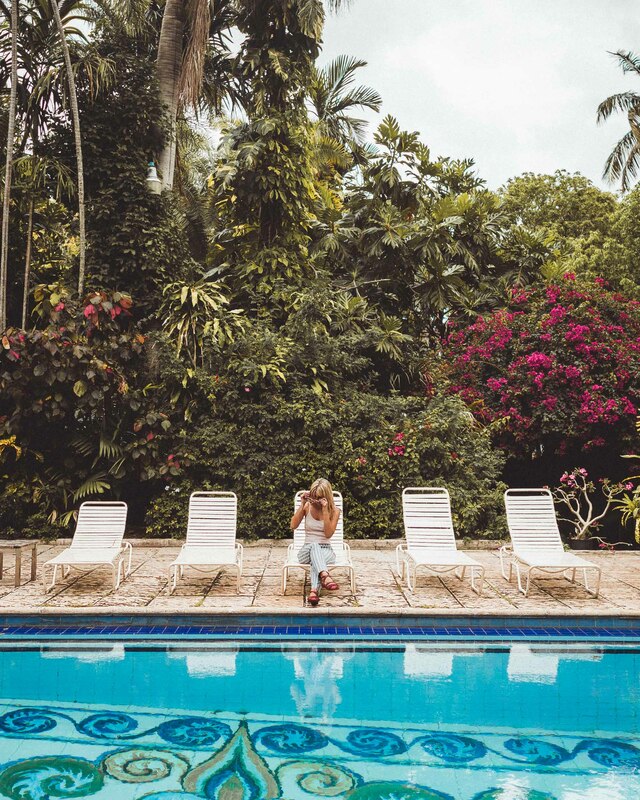 Graycliff Hotel & Restaurant – located in the heart of old town, Graycliff hotel is a historic colonial mansion with tropical gardens and pools that provide a welcome escape from the hustle and bustle of the island. Their wine cellar features over 250,000 bottles sourced from around the world, just a short walk from their on-site chocolate shop which offers lessons in chocolate-making. 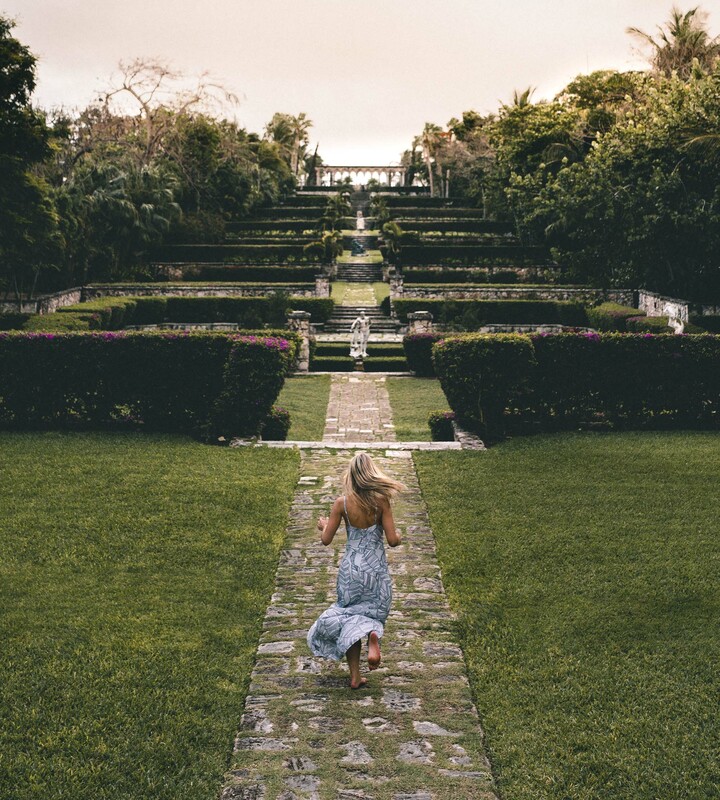 We got wonderfully lost exploring the grounds of this property! The historical building that houses Graycliff Hotel & Restaurant. The pool at Graycliff Hotel. 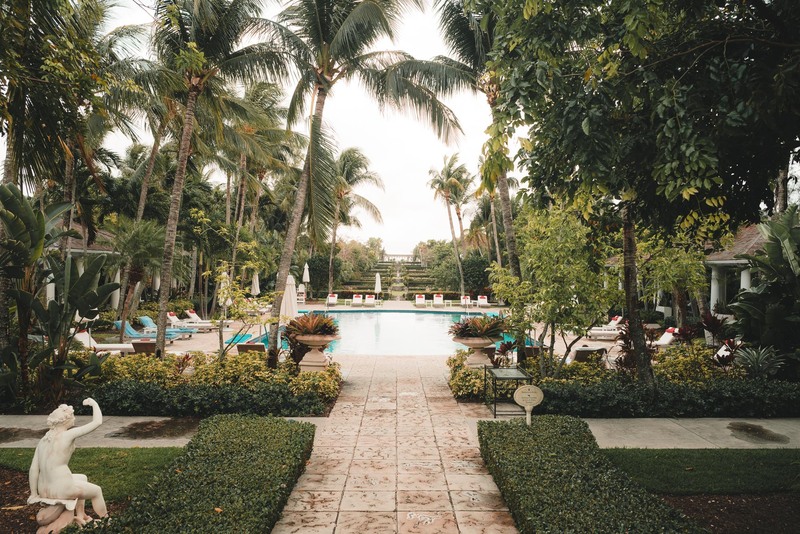 The Ocean Club, A Four Seasons Resort – transport yourself into luxury at this historic Four Seasons resort, which has played host to travelers and celebrities since 1962. It’s a unique and romantic property: we loved the stretch of white sand beach and the Versailles-inspired garden, complete with cloisters from a 12th-century French Augustinian monastery. Versailles Garden at The Ocean Club Four Seasons Resort. Ocean views from Dune Restaurant and bar. One of the many beautiful pools at The Ocean Club Resort. Atlantis Paradise Island – this oceanside resort has it all: bars and restaurants, a water park, golf course, casino, spa, and more. We had a blast visiting for the day to see the aquarium. 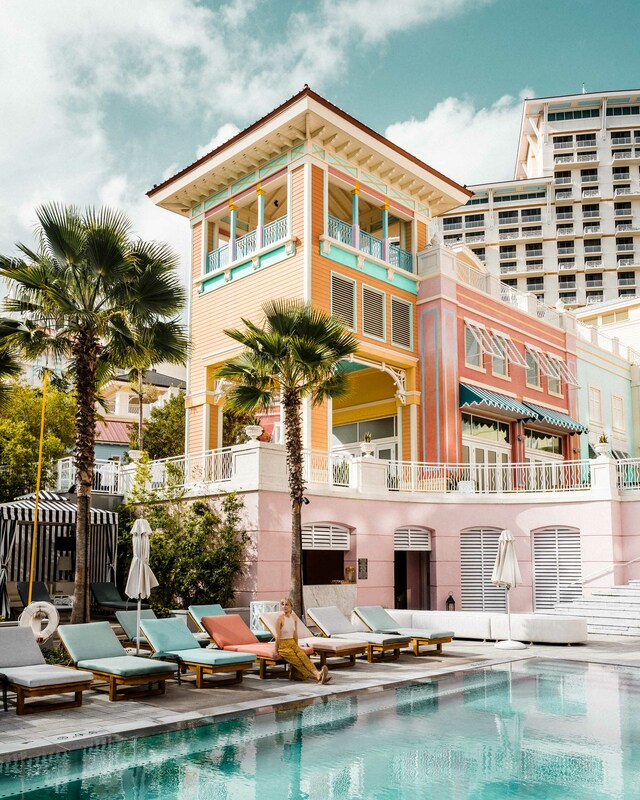 It’s an iconic property that’s been known to attract celebrities such as Kevin Hart and Serena Williams since its opening 22 years ago. 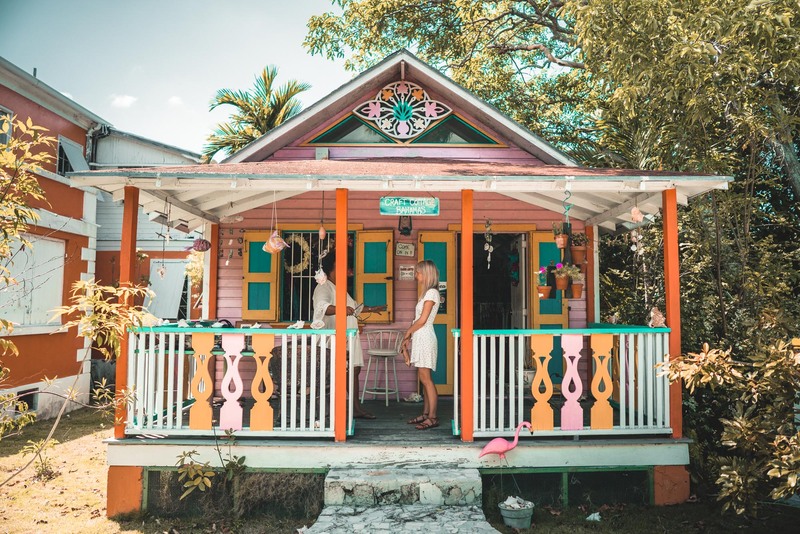 Bahamian Cookin’ – this local spot is a must-try at some point during your trip. 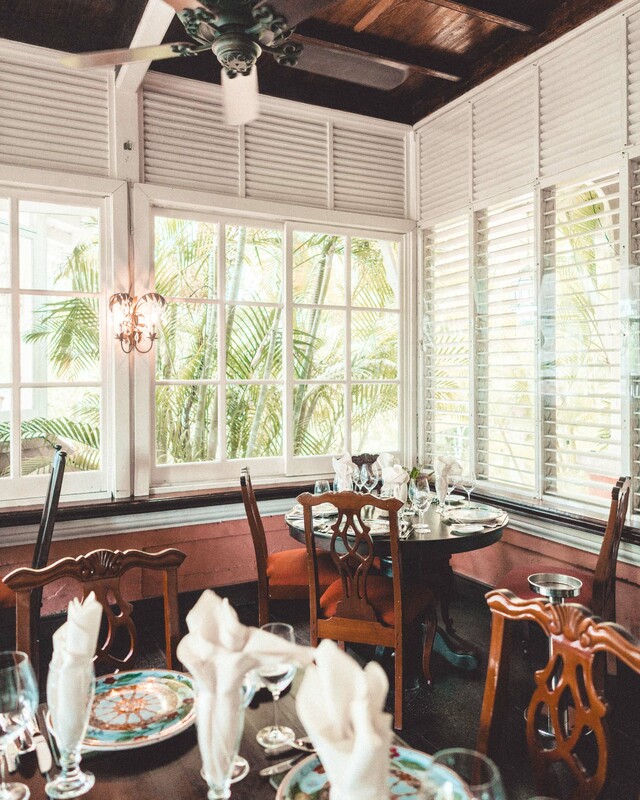 It’s simple and features classic Bahamian dishes, like conch fritters, cracked lobster, and steamed chicken. Biggity – this family-owned restaurant was built by hand with repurposed wood and natural elements. Their menu is simple and healthy, with flavors that pack a punch. A must for a laid-back, cozy meal downtown. Trying homemade specialties at Biggity in downtown Nassau. Sippin’ fresh lemonade during our food tour in downtown Nassau. Cleo Mediterraneo – one of our favorite meals of the trip, Cleo restaurant is located inside the SLS Baha Mar and features tapas-style mediterranean dishes. You’ll want to share — everything on the menu is so tasty! Louis & Steen’s – recommended by a local on the island, this New Orlean’s-style coffee house is eclectic (read: purple cottage) and serves up typical cajun-style dishes and excellent coffee. Graycliff Restaurant – this property is on our list twice for a reason! We didn’t get a chance to have dinner at this elegant restaurant, but we’ve heard it’s a real treat. At the very least, go for the atmosphere and wine selection alone. Exploring the grounds at Graycliff Hotel & Restaurant. Indoor seating at Graycliff restaurant. Athena Cafe & Bar – though conch is not typically a ‘Greek’ dish, I was pleasantly surprised by the flavors at this no-frills Greek cafe. Perfect if you’re craving something filling while exploring Nassau’s downtown. Social House – for fresh sushi, try Social House. Their lunch menu offers deals for the afternoon, or make it an evening and sample their small plates for an unforgettable experience. Swim with the pigs – Unfortunately the weather was not on our side the day we were meant to swim with the pigs. But, this experience is not to be missed! 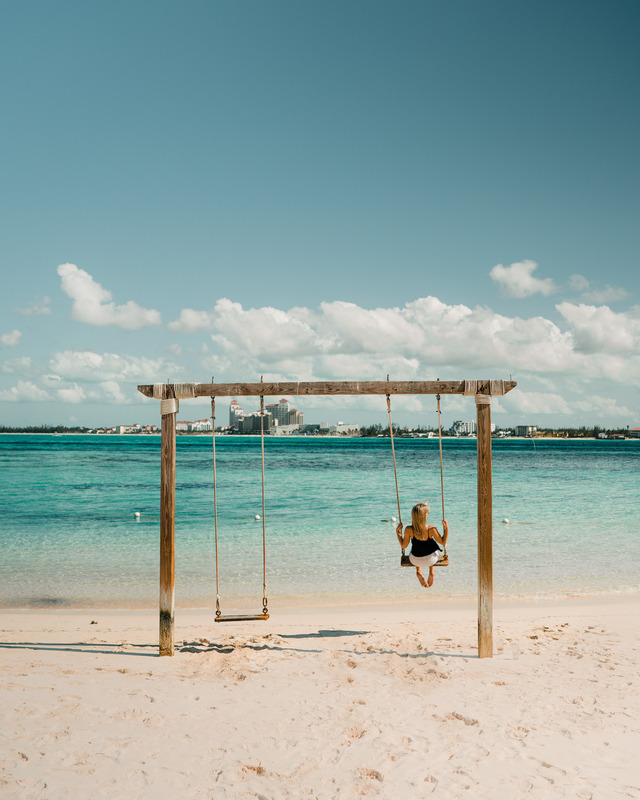 If you’re staying on Nassau, the closest option is the Sandy Toes experience on Rose Island. 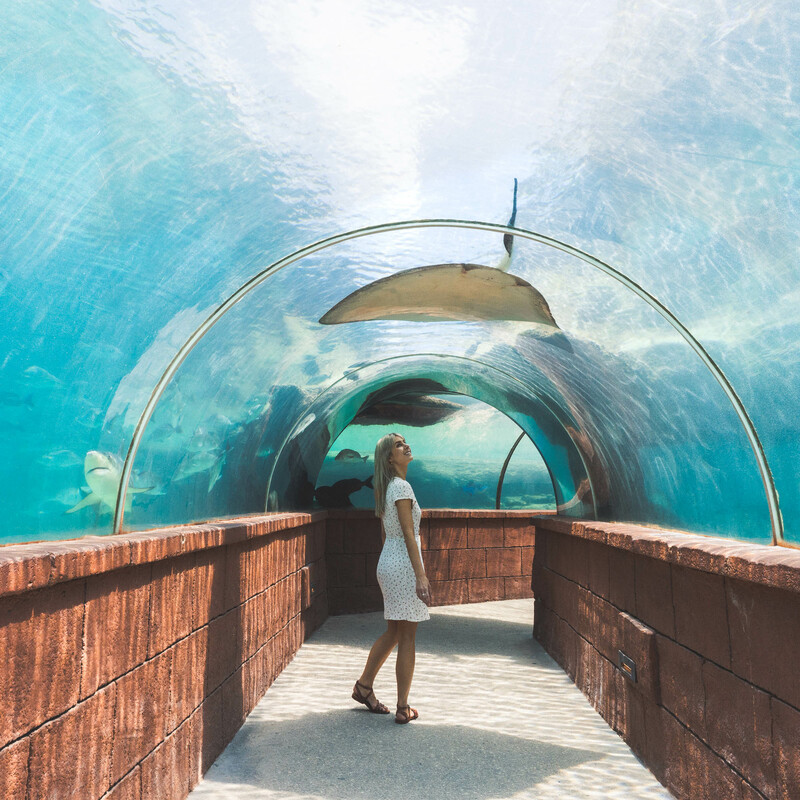 Visit the Atlantis Marine Habitat – the Atlantis property is huge and home to an amazing aquarium. You can buy day passes on their site to visit and explore for a day, which is also a great activity if you get hit with tropical rain. Exploring the Atlantis Marine Habitat at the Atlantis hotel. 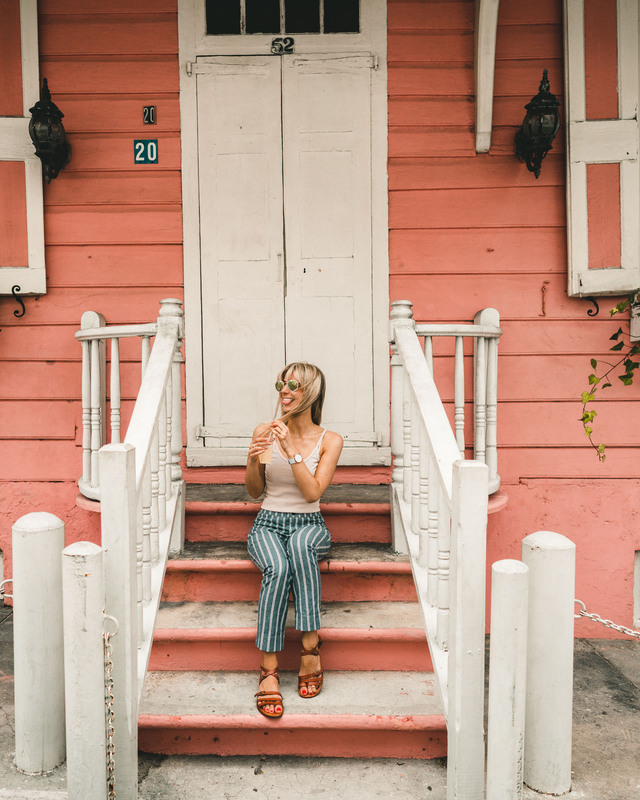 Go on a food tour – This is becoming a regular activity for Jacob and I when we travel, and I have to say it’s always one of our favorite parts of the trip. I’m always curious to see what places locals recommend and any excuse to eat is a plus. Tip: if you go on the food tour we went on, you’ll stop at Bahamian Cookin’, Athena Cafe, and Biggity. 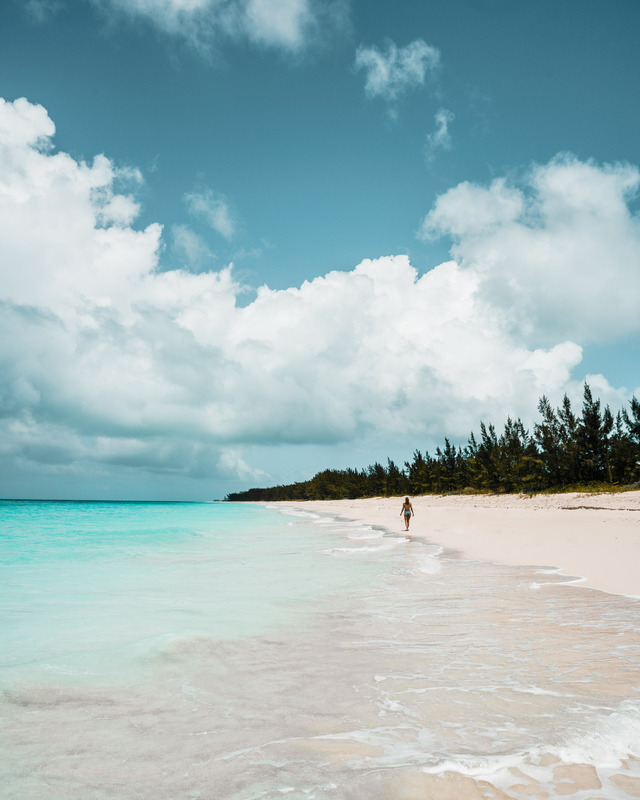 Take a boat tour – as with most destinations, we loved exploring local islands off Nassau with a private boat for the afternoon. 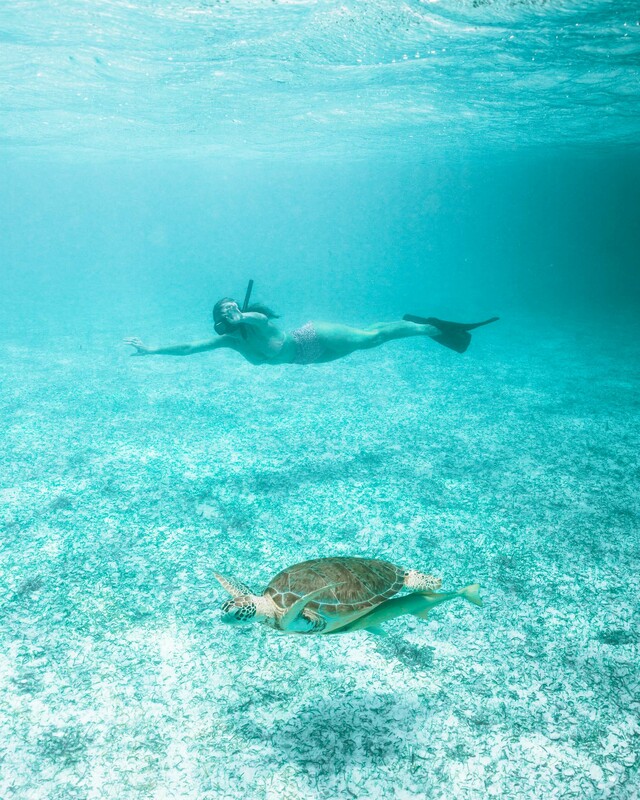 Don’t miss the turtles at Turtle Cay (tell your captain to take you!) and the sandy beaches of Rose Island for pristine water all to yourself. Rose Island’s empty beach on our boat day. Swimming with the turtles at Turtle Cay. Explore the local shops – a lot of on-island artists are represented. We loved visiting Doongalik Studios and Craft Cottage, located next to one another. The studio features artist’s work on display and Craft Cottage has a variety of handmade gifts for purchase. I bought a hand-carved ornament here for my mother. 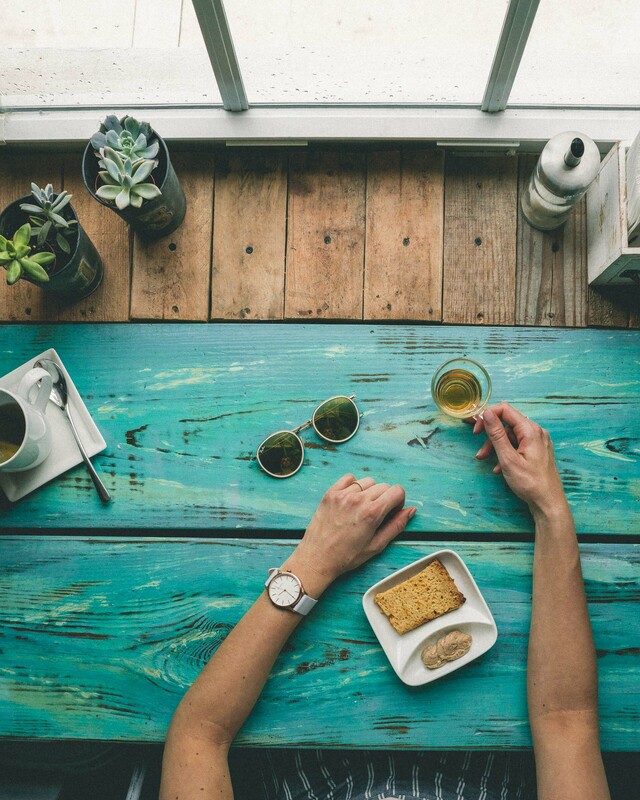 Chatting with Craft Cottage’s owner Fina about all the best local places to go on-island! Clifton Heritage Park – You can snorkel at this beach park, which features giant underwater sculptures. Bring an underwater camera! Montagu Beach & Fort – Take an afternoon to visit this public beach and surrounding area. 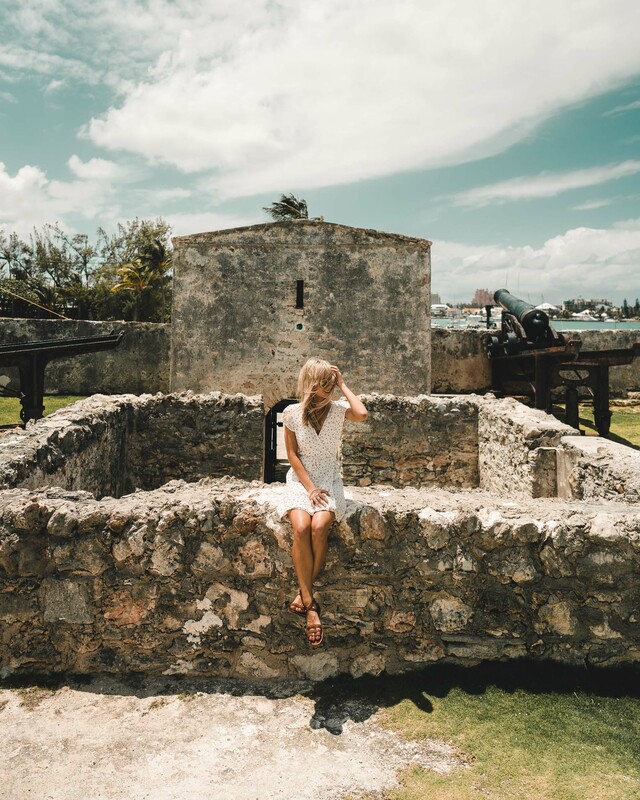 You can visit historic Fort Montagu for $2 a person. Another highlight is the nearby fish market, which features fresh conch salads for sale (and lots of live conch!). Inside Fort Montagu on Montagu Beach. Conch shells at a local fish market in Nassau. 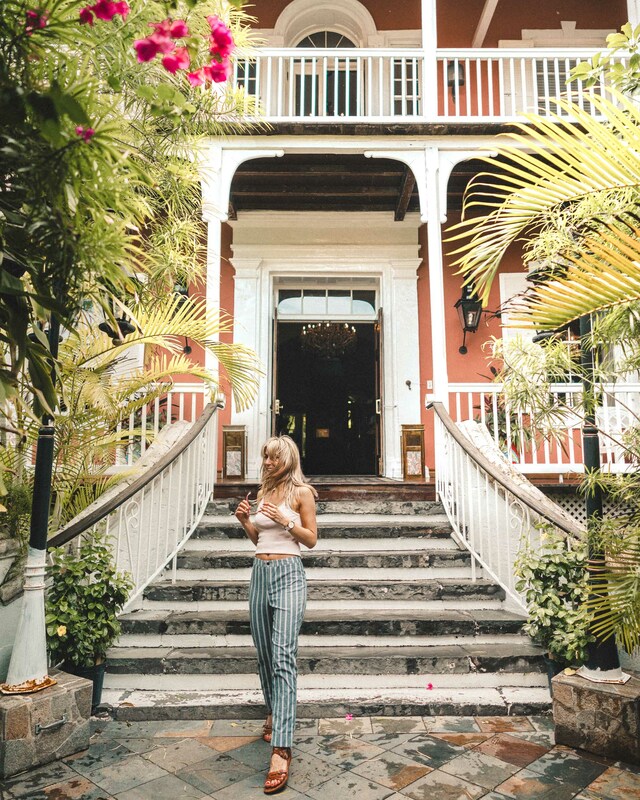 Bay Street – Explore the architecture in Nassau’s downtown by heading to Bay Street. There are local markets here, but we found them to be a bit too tourist-driven for our taste. The real highlight are the old buildings, and charming neighborhood spots like Biggity. An empty stretch of beach we found nearby our hotel. 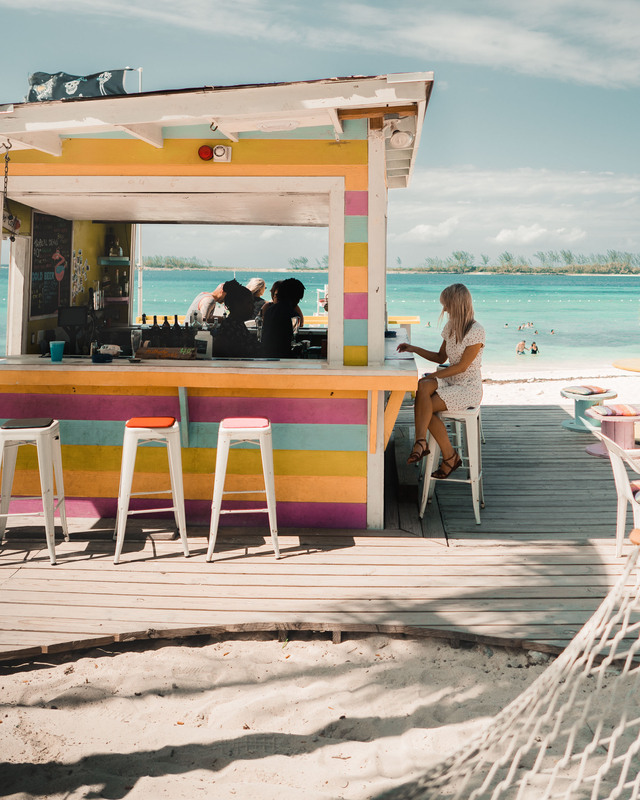 Lunch and drink shacks on Junkanoo Beach in Nassau. Light, breathable clothing — think linen pants, flowy dresses. A beach bag you don’t mind getting sandy. A jean jacket for the evenings and when it gets windy. A hat and plenty of sunscreen. Like most tropical islands, summers can be warm and also rainy. Hurricane season is July to October and high season is November to April. We visited at the end of April and had sunny (but windy!) days, with spots of tropical rain. If you don’t mind crowds, head to Nassau during high season. The majority of the shops and restaurants on the island take U.S. dollars and converters are U.S. standard, so don’t worry about either if you’re visiting from the states. 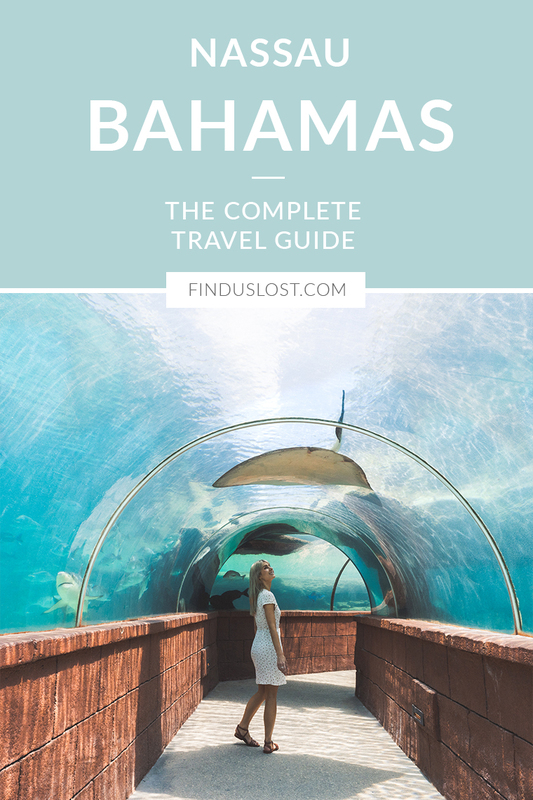 For more information on what to do, hotels, and other activities in Nassau Paradise Island, check out NassauParadiseIsland.com. A big thank you to the Nassau Paradise Island team for hosting us so we could capture the beauty of this island! As always, all opinions from this trip are our own. 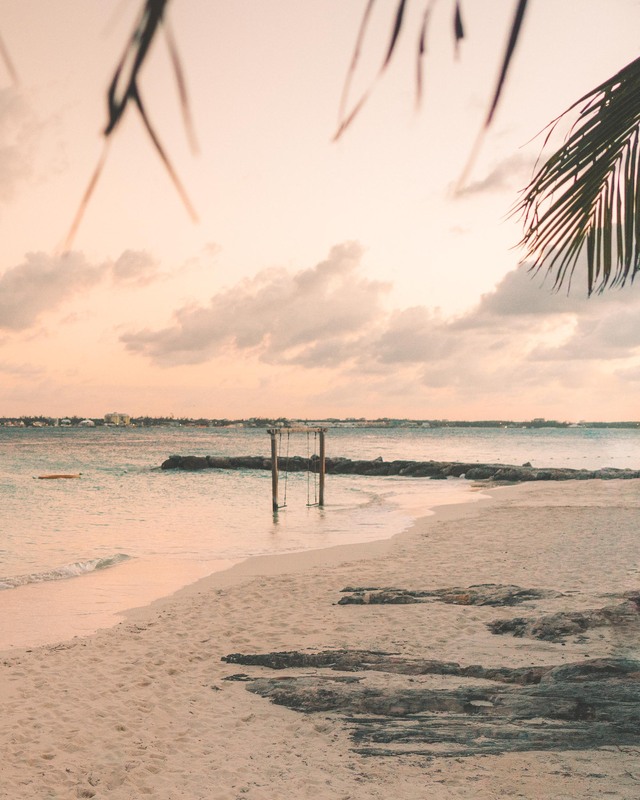 Bahamas is an incredible place to disconnect from routine. , who wouldn’t relax?. It’s really the perfect place if you like the beach. Wooow, this pictures are so good! Which camera do you use? 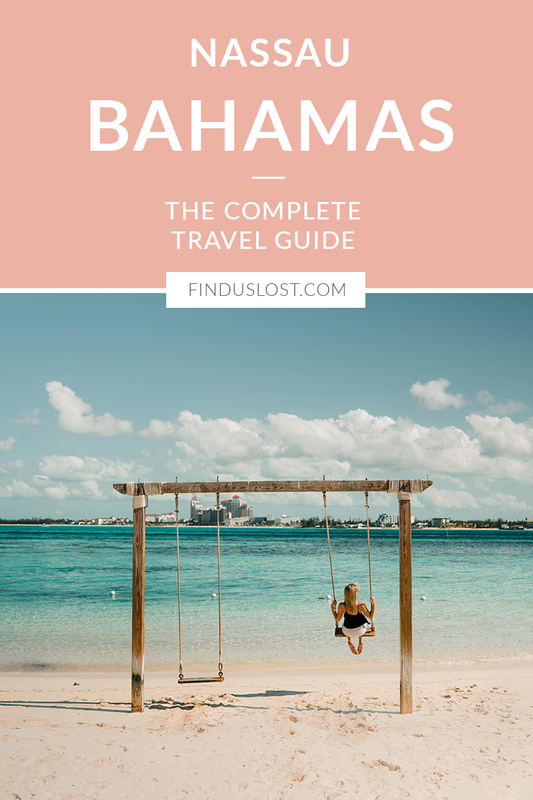 I am taking a trip to Nassau and found this to be so incredibly helpful. If you remember, what private boat tour company did you use for your trip to Rose Island and Turtle Cay? So amazing and so excited to visit in May! What are your recommendations about best getting around the island? Thank you!